Transparency of fees is very important to us. We want our clients to understand the fees they’re paying – not just the fees you pay to us, but your all-in fees – including product, trading, and miscellaneous fees. Advisors don’t always disclose the details of these other fees to their clients, but we think you need to know what you’re actually paying! The two primary drivers of the fees you pay are the size of your portfolio and what you’re invested in. Before you ever sign on the dotted line, we’ll explain your all-in fees in plain English, so you’ll understand what you’re paying. For businesses that engage us to consult on 401(k) or other employee benefits plan, our fees start at $5,000 per year. Our fees are based on the complexity of your plan, the number of employees you have, and the frequency of education services provided to employees. In addition to our fees, you and your employees can expect to pay recordkeeping, administration, and product fees. We’ll help you understand the total costs for running your retirement plan, so you can make informed decisions. Financial planning fees vary based on the scope of the project and the existing assets under management with the client. Per project financial planning fees range from $2,500 – $6,000. Business valuation fees for all clients start at $2,500 per valuation project. One of our primary objectives is to construct a portfolio with all-in costs less than 1.5%. Mutual funds and exchange-traded funds (ETFs) have underlying expense ratios that should be accounted for when calculating your total all-in portfolio cost. 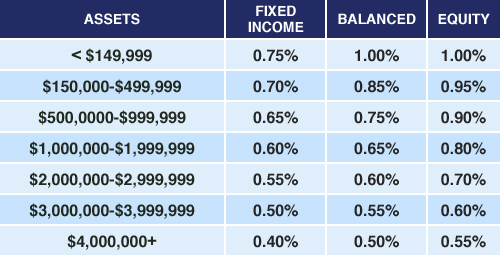 The fees on mutual funds, ETFs, and outside managers we use for our clients generally range from .05%-.85% annually. Clients pay fees for trades made in their account and may occasionally pay fees for requested services, like wire transfers. These fees are explained in the Schwab Pricing Schedule and disclosures provided to all clients. Article: Financial Advisor Fees Comparison – All-In Costs For The Typical Financial Advisor?